With a slight stumble, comedian Bill Cosby has arrived for the fourth day of jury selection in his retrial on sexual assault charges. 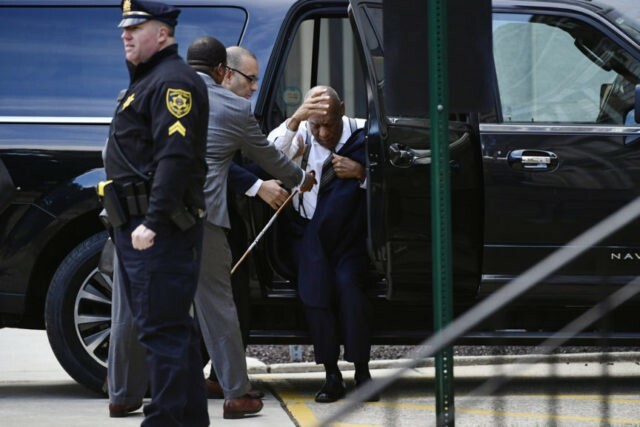 Cosby stumbled a bit getting out of an SUV on Thursday and then put a hand up to say he was OK before walking into the suburban Philadelphia courthouse where lawyers will work to pick six alternate jurors. Prosecutors and the defense settled Wednesday on the last five of the 12 jurors who will sit in judgment of the 80-year-old comedian. One juror was chosen Monday and six on Tuesday. Cosby is charged with drugging and molesting a former Temple University athletics administrator at his home in 2004. The judge last June declared a mistrial after more than 52 hours of jury deliberations over six days. One juror said the panel was split 10-2 in favor of conviction, while another said the group was more evenly divided. The jury picked to decide Bill Cosby’s fate in the first big trial of the #MeToo era mirrors the gender and racial makeup of the group that deadlocked in last year’s trial. There are seven men and five women. Ten are white, two are black. Jury selection resumes for a fourth day on Thursday as the prosecution and defense work to select six alternates. Race dominated Wednesday’s selection process. Cosby’s lawyers alleged a member of the prosecution team made a disparaging remark after prosecutors rejected one of the few black women considered for the case. District Attorney Kevin Steele rejected the allegations. He said prosecutors had no problem seating the two other black people who had appeared for individual questioning. The defense never revealed what they claim was said and agreed to pick more jurors.